Crush graham crackers in food processor or plastic baggie. Add melted butter and mix with fork. Press mixture into 6 holes on mini muffin tin. Place 4 chocolate chips on each graham cracker cup. Cut marshmallows in half using kitchen shears. Place marhmallow half on top of chips (cut side down). Return to oven for 3 minutes (until mashmallow is slightly soft). Place on cooling rack for 15 minutes. Melt remaining chips in microwave by heating for 30 seconds and stirring then repeating until melted and smooth. 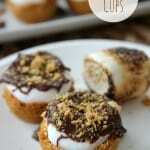 Remove cups from muffin tin, top marshmallow with melted chocolate. You can optionally crush an additional graham cracker to used as topping on the cups.